Brooklyn Apartments will bring a taste of New York to the Gold Coast. Inspired by the vibe of Manhattan the soon to be launched Brooklyn is already being snapped up by locals. Brooklyn’s unique architectural design, high rental returns, convenient location and low entry price point (from $319,000) make the mixed-use development a highly desirable investment choice for people who work, live or play in Varsity Lakes. Mark Howard, joint-developer of Brooklyn, said the predominantly locally based buyers ranged from first-home owners through to investors. “People don’t want to just buy a ‘nice’ looking apartment anymore, they want ease and convenience when it comes to their daily routine,” Mr Howard said. “Residents can head downstairs, buy a morning coffee at their café, check emails using Wi-Fi then in five minutes they can be at the train station, university or they’re just 10 minutes away from the beach by car. 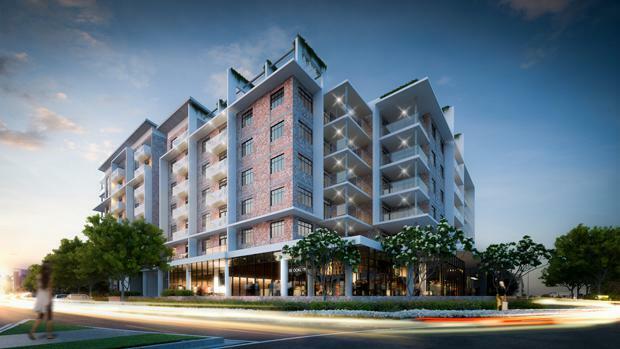 Brooklyn Apartments, will comprise a six storey residential tower with 88 apartments, including one and two bedroom apartments and large open-plan three bedroom penthouses split over two-levels. The project will be a unique environment for the city, consisting of office studios, eateries, and various retail spaces, offering residents and locals a range of amenity and leisure experiences in one venue.